2. Halloween is like an event on our street. Lots of kids, candy, neighbors and "visiting". SO FUN! 3. Makes me wish it fell on a weekend night every year (and especially not on a Monday-ZZZZ)! Have a great Halloween, Christina! So adorable! Happy Halloween to you too! 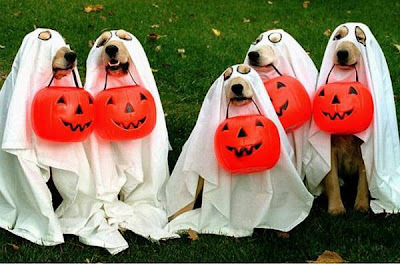 My kids are older and I don't have dogs to dress up, so I have to get my Halloween fun from all the visitors. I got this funny email about why dogs bite. Dressing them up in Halloween costumes was one of the reasons. 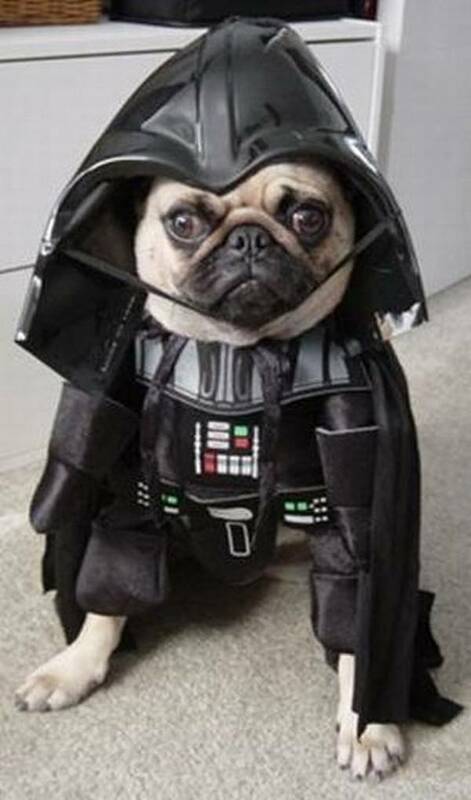 I think the pug will be a biter. Happy Halloween to you, too. Stina, we did a cat design this year! Lisa, LOL—I could totally see that. My dog wouldn’t let me anywhere NEAR her! That first picture made me snort! Haha.... Love that dogs legs! Too funny. Have a fantastic Halloween, too! Have a safe and fun night! Ha! I've also heard that dogs are miserable in costumes. But they look so darn cute in them. The most I've put on my dog is a sweater that he only wears when it is frigid outside. Have a wonderful day trick-or-treating with your son or passing out candy at the door. Which job did you get? You're not one of those houses that puts candy out for the kids to take on the honor system while you go out trick-or-treating, are you? I could never bring myself to be that trusting. Aw, how fun! Love that your neighborhood makes it an event. My apartment building...not so much. Happy Halloween! I'm such a Debbie Downer. I hate Halloween. Even as a kid, my parents used to force me to dress up and participate. The only reason I like it now is because I have kids, but it is also my 2nd son's birthday as well as my dad's. We only have a few kids who come to the house and the one's who do, the paretns drive them in cars! I hope you have fun! Those are some great photos. It's always a big question mark how many kids we'll get at our house, so we overbuy candy (and then sacrifice ourselves by eating the leftovers). I love seeing all the kids in their costumes. Ha, those pictures are hilarious. I adore Halloween, the cute kids and my love of carving faces in big squash. we've apparently moved to a BIG Halloween neighborhood, so I'll be getting the full experience tonight. Hope I bought enough candy! Halloween is exhausting but so much fun! One classroom party down, two more to go and trick or treating! Hope your Halloween is ghoulishly spooktacular! I love the Halloween costumes! I'd make my parents' dogs wear costumes, except they would find a way to squirm out of them eventually. The last several years, my daughters have asked us to drive them to friends' houses for trick-or-treating. We have only 13 houses in our neighborhood, and I'd say half of them don't participate. So that leaves my husband and I alone on Halloween for a good chunk of the evening. They should just go ahead and make it the 4th Saturday of the month every year! That would be better! My kids did NOT want to get up this morning. Last year was better. With Halloween on Sunday, they had Monday off from school. I think the day after Halloween should always be a day off from school! 1. We always trick or treat on my mom's street...it's got way more action! 2. Totally agree...last Friday of October starting next year! But keep everything up til November 1st! I am soooo tired today.